For general automotive modeling or non-modeling topics. There is currently no campaign page to enlist, but I am starting this thread anyway. I'm sure it will be there eventually. I will be working on the Tamiya 1/20 Brabham BT46. I bought this in the 80s back when I bought a 1:1 Alfa Romeo Spider and started following Formula 1. This is the current state. I was wondering if I should re=paint the engine as a small note that I missed says to add some Gold Leaf paint to the Aluminum paint. It doesn't say how much though. So I looked for images of the Alfa Flat-12 and then wished I hadn't found them. The actual engine block is plain Aluminum but the cylinder heads, camshaft covers, and throttle plates are gold tint, as are some other pieces. Now I am wondering if I should re-paint these or just move on. Oh, and the distributor cap should look like a normal distributor cap rather than the spider-like thing Tamiya gives you. Again, fix or move on? If it's still out of the model like that then painting them might add a few detail touches that may make the final build pop. Enlisted. Now, which of the many do I choose? I'm in! Possible finish up the 1974 Kenworth K100 or the 1974 Kenworth W900. We'll just have to see. Ok, now that it is formally on, I'll go with the Mustang II. Lots of pieces left, botched paint job etc. I will post pics next week when I am back from my holiday. I have a '55 Pick Up that needs completion but if I don't finish it again by this deadline, then what? Like all the other campaigns for unfinished kits, I hope this will be an annual thing. I will try to mix up the right shade to re-paint those engine parts. I looked into adding clear fuel lines, but I don't think I will. The throttle plates have little nubs on them where the lines connect, but the problem is there are no connectors at the fuel pump (I assume that's what it is). The distributer is all glued so I will probably leave that as well. I don't know if I'll fashion the spark plug connector. I am tempted as they would add more color to the engine. Well, here's my Garage Queen, I it's a Revellogram 1969 Chevy Camaro Z-28 R/S. Pretty much all built up, just need to figure how to get a glossy paint job on it (unlike the original Chevy paint) and then I can start finishing it up. Maybe when I replace the steering wheel, it will be high enough to get some 1/25 scale legs under it. I totally agree Gary, I'm sure there are plenty of Auto kits lying in wait for just this opportunity! Since Photobucket's recent antics have blocked the images from the 50's Group Build thread, I might start a dedicated build log thread and repost all of my progress so far. First order of business with my recently acquired AutoModeler Admin superpowers - create a gallery for Garage Queens 2018 HERE . Well, the 55 Nomad has been in progress longer then any of the other wip, I have on my desk. Started this one in 2016, so it might not qualify as a thoroughbred garage queen, but I really need to finish this on. So AMT 1955 Chevy Nomad it is. Hi, enlisted. 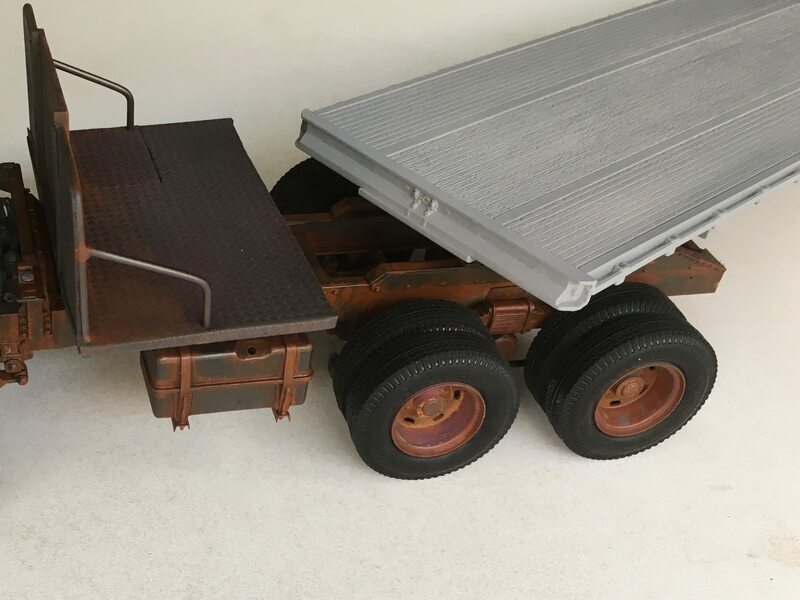 I’ve got a Fujimi Hino 1/24 scale in the cabinet, together with an AMT Fruehauf flatbed trailer. Supposed to be a Thai trucker on the road with a special load. Lots of scratch build. Will post some pictures tomorrow. First have to finish my 1/1 scale house moving and restoration, but end of this year is easy to finish this project! Feel free to steal it and use it if you want! Hey, it looks like I successfully stole it! I used Tamiya acrylic Gloss Black on the body and wasn't happy at all with the results. I thought I might be able to work with it but it's just too rough. The last thing I did before this went back in the box was strip the paint, now I need to decide whether to go with an airbrushed lacquer finish or a rattle can. Some pictures of my progress, better where I left my build of the Hino Super Dolphin. 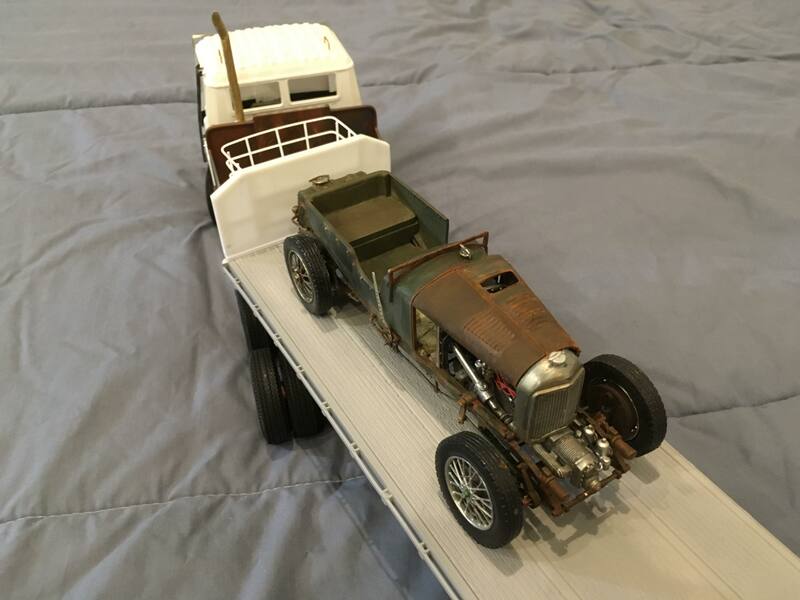 Here's the Fruehauf, still unpainted, but mostly finished the build by that time. Did some improvements to make it Thai style. Already has the special load on the bed. 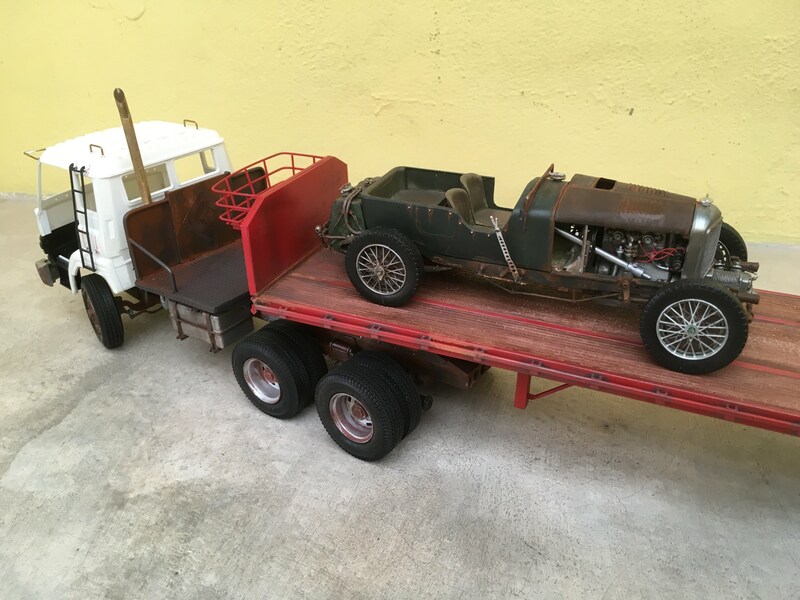 The special load is a completely rebuild vintage Heller kit. My fathers build from long time ago. Needs some more details and finishing touches to make it a real barn find. Back again. Pushed a wrong button. 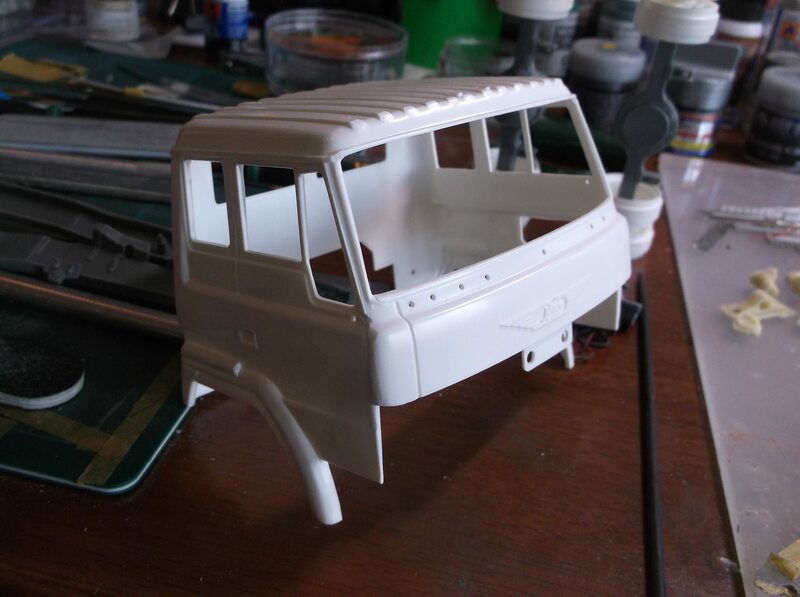 The truck chassis has already a prime coating and pre shading for rust. A coat of black will follow. Will use hairspray and salt technique to give it a real worn out look. Scratch build the platform behind the cabin. Thai style with a decoration. From this picture you can see that the whole chassis is rebuild. 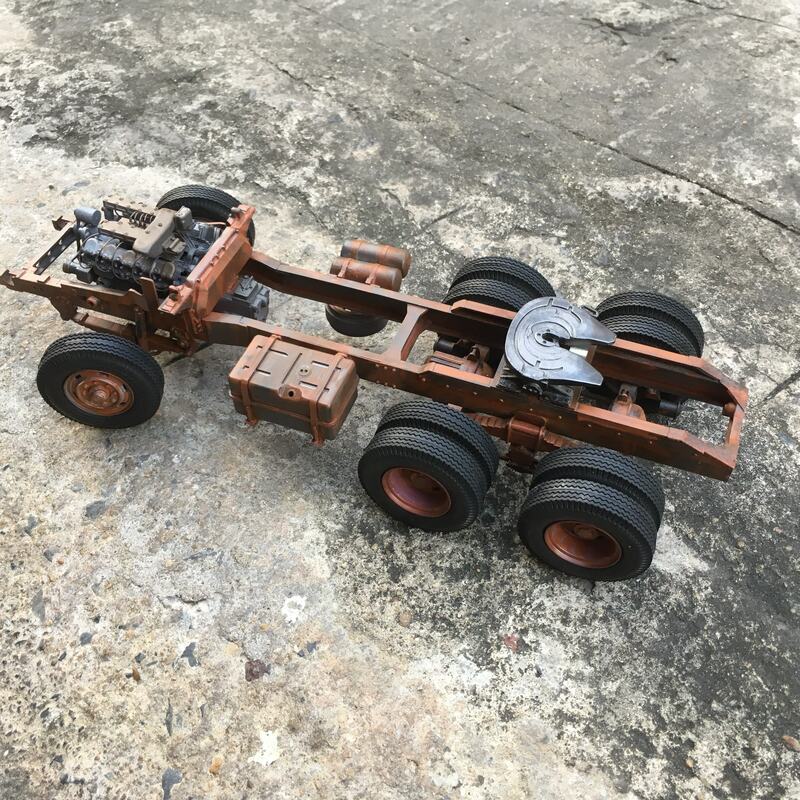 I used sets from KFS for the chassis, steering and thread plate. More progress on the model. Last one shows the paint job on the flatbed. Painted the chassis in red using my airbrush. 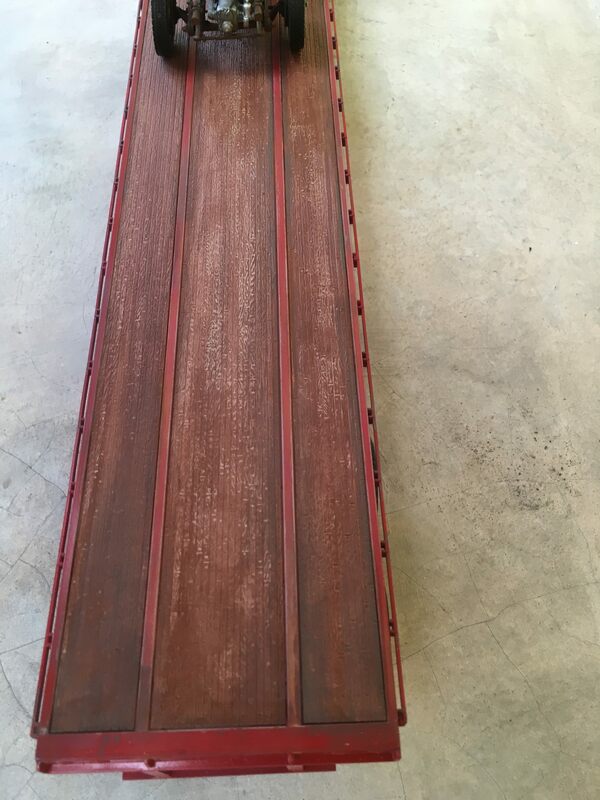 Wood colour is a mix of sand and other browns, hand painted and very well thinned. Covered it with wood grain decals. 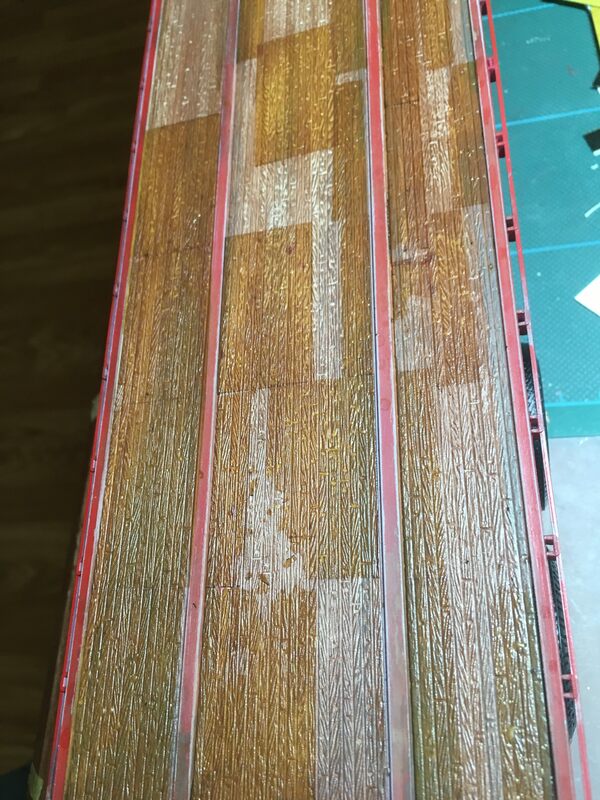 After a few layers of clear lacquer and washes, it looked like this. The patchwork gives it a nice worn out look. This is how the models got stalled in my cabinet, waiting for a finish. So when there is time over the coming months, I will post my progress on this. Wow. Is that a the Heller kit a Bentley? The trailer looks good! I'm looking forward to your work on the truck.